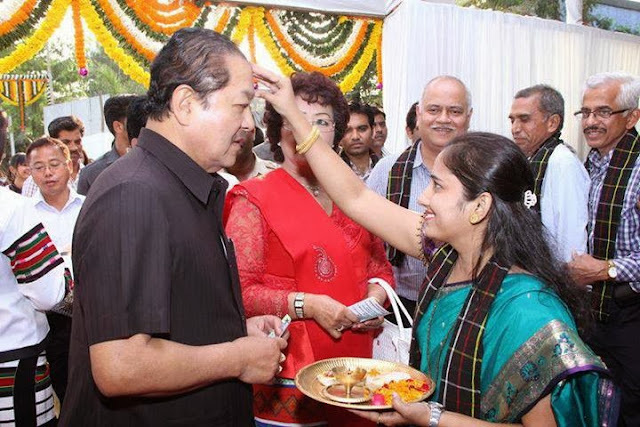 New Delhi, Nov 19 : A tilak on the forehead of four-time Mizoram Chief Minister Lal Thanhawla has been raked up into a poll issue, as the Opposition in the north-eastern state take up Mizo nationalism as their main plank. The main Opposition alliance Mizoram Democratic Alliance seems to be exploiting the frustration inherent from a highly-educated young population, who are currently seeing high levels of unemployment. “The Mizoram Assembly election will be a landmark in the history of Mizoram as it is the battle between the devotees of Mizo nationalism and the leaders who want the Indianisation of Mizo nation,” said Alliance’s joint statement. Local reports added that the MDA also boasted that they were free from “idolatory, spotting tilak, and practice of offering money to poor people to tame them by taking the advantage of their poverty”. The joint statement affirmed that the MDA was trying its best to establish the government adaptable to Zo nations which would protect the religion, culture and tradition of Mizo as enshrined in the Constitution of India. It is not surprising that the opposition has been using religion as a plank, with the Church being a strong influence in the state which has a majority Christian population. One of the last posts on the alliance’s Facebook page has a photograph of the CM at a Durga puja pandal. It’s not a new allegation against the CM, who has been pilloried by MNF and other opposition parties for also breaking a coconut at a inauguration ceremony, terming it as a Hindu ritual. A photograph of the CM sporting a tilak has also been in circulation, used by the opposition claiming that he is a “weak Mizo”. The Congress defended the CM, by pointing that ‘tilak’ is not religion, but part of culture, as normal as a western handshake.